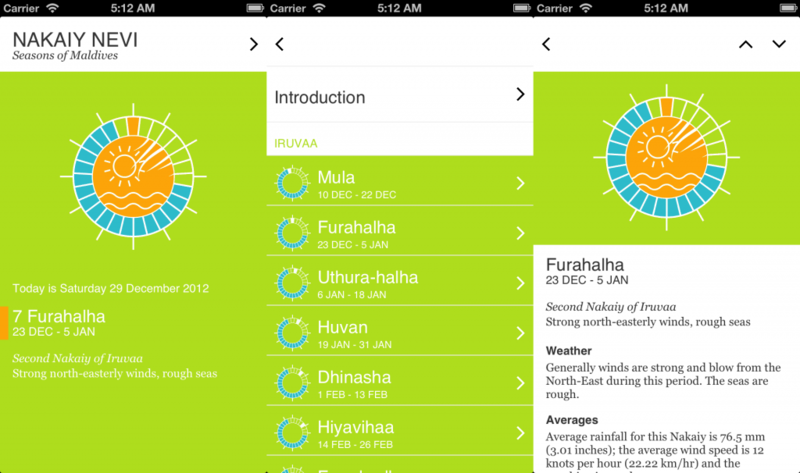 The indigenous Maldivian calendar system (Nakaiy) with weather observations. Tap into centuries old wisdom to gain deeper insight and discover weather patterns through the indigenous Nakaiy Calendar. Geo-specific to the Maldives, one of the most fragile environments on earth, at a time of shifting weather patterns on a global scale we can look and learn from the past to enable us to better prepare for the future. Special thanks to Ali Shafee Saeed (Topi) & Lintel Investments and Management Services Pvt. Ltd.
All data for the app has been sourced from: Vanavaru by Hassan Ahmed Maniku & Vonadhona Raajje (Rahvehi Kamuge Theyreyrai Dhivehin Part 1) by Ahmed Shafeeq.